The Goat, assisted by The BUTCHER and LORDHELL. 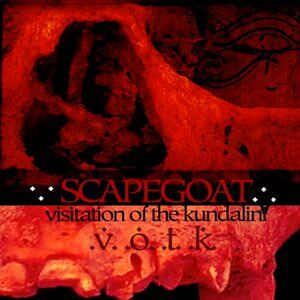 Scapegoat began in the early 1990's. It was in a dark building in downtown Salt Lake City, during the twilight hours. Heavily inspired by Legion, Lustmord, Controlled Bleeding, Ain Soph, Zero Kama, LAShTAL and other ritual and dark ambient sounds, The Goat combines these feelings and ideals with our own unique sounds. We use electronics and acoustic instruments, and a great deal of our sounds are supplied by the ambience of the dark world around us in various locales, as well as our own voices. Our material will range from the harshest noise to lush ambient sounds. There is no god. There is no magic. There is no heaven nor is there a hell. There is only Science. There is only Logic. There is only Death. Only Space and Time are Reality. After Death, Space and Time blur and distort- and one can travel wherever- and whenever- one wishes. We have found a way to do this before death. Use our sounds.